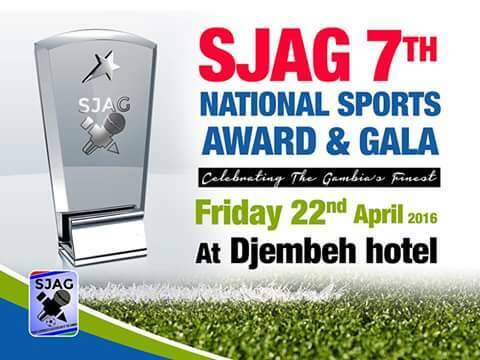 The Annual National Sports Award and Gala Night, organized by the Sports Journalists’ Association of The Gambia (SJAG) has been scheduled for 22 April 2017. The annual Sports Award Night exclusively organised by the Sports Journalists’ Association of The Gambia is meant to recognize and reward past and present sports personalities, “an initiative worth supporting by every Gambian”. The fundamental mission of SJAG is to enhance the development of sports journalism in The Gambia to the highest level possible. The association has been staging the event for the past seven years, and the organisers are looking forward to another successful event. It is, therefore, important and befitting for all Gambians to come onboard and be part of this event as we want to celebrate our own countrymen and women who immensely contributed to sports development in the past and present. It is high time we were seen celebrating our own athletes in a different style. Like previous editions, this year’s award is expected to be graced by prominent personalities from within and outside the country. This is a national event that The Gambia and every patriotic Gambian should be seen actively contributing towards making it a successful one, and the association is calling on public and private institutions to partner in staging the event. The different categories for this year’s award ceremony are: Sports Personality of The Year Award, Best Local Based Athlete 2016, Best Foreign Based Athlete 2016, Best Coach of the Year 2016, Best Team of the Year 2016, Institution in Support of Sports, and Best Referee of The Year 2016. Institutions and companies that wish to be part of this memorable night can call: 7493424, 7750073, 3813805, or 9618302.